Is It Really Okay When We Say “It’s Okay”? - Welcome Authors! Is It Really Okay When We Say “It’s Okay”? When was the last time you told someone–or yourself–“It’s okay”? This post was originally written for new parents; but it applies to all of us grown-ups as we “grow up again”! “It’s okay” and “you’re okay” are common phrases. Most of us have heard and used them all our lives, especially for calming down upset children. But I like to take a serious look at the messages we communicate to our children and to each other. You and I have adult-sized brains and life experience, and we know that it often is “going to be okay.” But even so, in the moment we’re upset, we’re feeling whatever we’re feeling, and that feels real–-right? If a baby is crying… then it really doesn’t feel okay to her. In other words, it’s really not okay. Babies are in-the-now, new to Earth’s realities, and they express their honest feelings–-until they learn to squelch them. When you find yourself saying “it’s okay, darling” (it’s a hard habit to break! ), what if you change it up a bit? Something like: “It’s okay to cry,” “that seemed scary for you,” “you sound angry,” “you bumped your head, did it hurt?” These statements acknowledge feelings and what just happened. This will help preserve her trust in her own feelings and intuition. For if she feels that it’s not okay, but we say it is okay, we have just created a conflict–-a potentially confusing internal mismatch that can eventually lead to mistrust or denial of her feelings. Clarifying how we communicate also helps preserve that trusting relationship every parent wants with his/her child! It can catch us off guard–when we find that what we thought was supportive actually may send the opposite message! When a child’s feelings are dismissed (even lovingly and unknowingly! ), she may grow up feeling she must hide her true feelings or that she can’t confide in those to whom she’s closest. Also, think of manipulative or abusive situations that could happen later in childhood or adulthood. We want to make sure our children stay safe, right? How do we truly empower them to know the difference between safe and unsafe situations? What if an abuser or kidnapper were to say “it’s okay, honey…”? What if the child gave in, bypassing her internal red flags because she’s used to adults knowing (and telling her) what’s okay and what’s not. We want her to trust her gut feelings that it’s really not okay. So, in a counter-intuitive way, not saying “it’s okay” now, when we assume from our adult perspective that it really will be okay… builds trust and healthy communication skills for recognizing situations when someone with ‘power’ says “it’s okay” but it’s really not. That’s an extreme, but extremes are all around us. On the loving-home front, this will support good stuff like self-trust, honest communication, and emotional literacy. The ability to identify our emotions is an important skill that many adults actually find very difficult. No wonder! 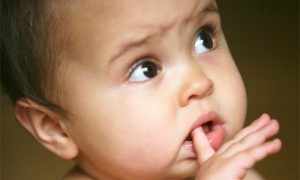 For more info about how to support a crying baby/child without ignoring or distracting, see my website, www.ConsciousBaby.com. This is really good stuff! My daughter has a new 2-month old daughter and I am happy to share with her your site! Thank you!! Thanks, Julie, and thanks so much for sharing it with your daughter and granddaughter!